Politics had an intimate impact on John A. Pérez’s life from an early age. The newly elected Speaker of the California Assembly recalled two policies of the Reagan administration that changed his family’s life when he was a young teen. The first happened when his father, “a sheet metal worker by day and a cook by night,” was injured in an industrial accident and Reagan changed the definition of disability. “It took him one and a half years to reprove disability,” Pérez recalled. The second limited his mother’s ability to work – cuts to social service agencies transformed the environment at the community clinic she ran. 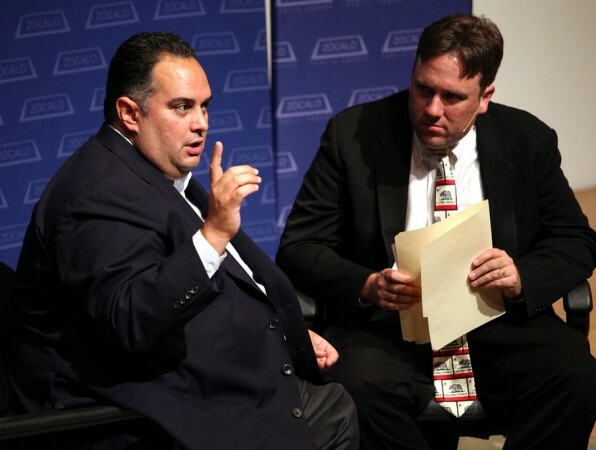 And of course, Pérez was a unique candidate who began acknowledging his homosexuality openly in 1994, and won statewide office in a district where the majority voted for anti-gay legislation in 2000 and 2008. Pérez shared with interviewer Joe Mathews of the New America Foundation and the crowd at MOCA his thoughts on his career and the future of California. California’s 12.8 percent statewide unemployment rate is the third highest in the country; in some parts of the state, feeling the effects of a multiyear economic meltdown, the mortgage crisis, and a drought, that rate shoots to 40 percent. The solution, Pérez suggested, was to make changes where possible: repurposing the gas tax by shifting the way it’s used without increasing the price of gas; funding transit-related construction so that public transportation can take people to and from work, or to look for work; and offering a tax credit for first-time homebuyers whether they’re buying a new or a old home. Pérez also noted that California now incentivizes green manufacture by offering equipment for it free of sales tax. It’s a crucial measure, he said, for a state at the cutting edge of technology, but one that loses manufacturing work to other states and countries. On healthcare, Pérez said that he is creating the framework to implement national reform, keeping close communication with federal officials. “It’s a 2500-page bill that most states still don’t know all the details of,” he said. There are also complications: the demographic shift of the populationputs different pressures on the reform. California has three million undocumented residents, “a huge burden,” particularly when people wait to access healthcare until an emergency. Pérez said that national immigration reform needs to follow on the heels of healthcare reform. And because California’s cost of living is high, many Californians don’t qualify for public benefits, since they’re based on a nationally-calculated poverty level. Buying healthcare on the open market was impossible, for instance, for Pérez’s sister, who started a small business of her own and was diagnosed with a chronic disease. Pérez unionized her employees to let them absorb higher risk and keep purchase prices low. “That was the day she was happy her brother came and unionized,” Pérez said. 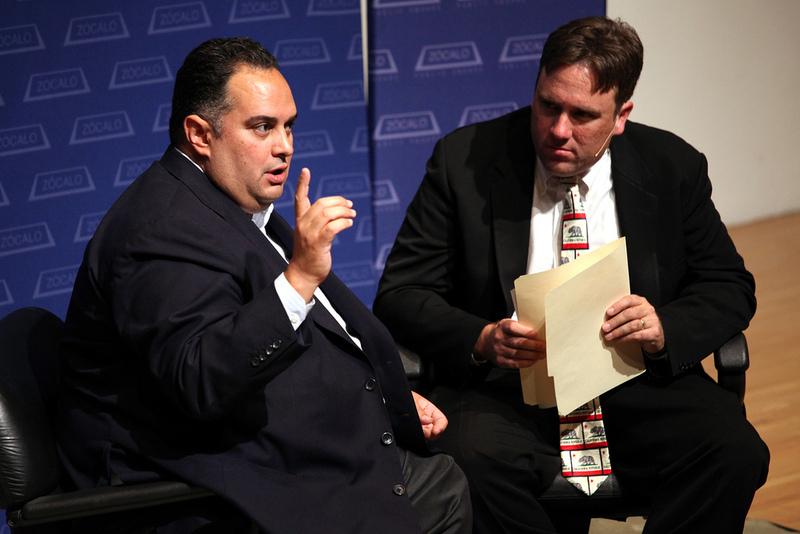 Pérez noted that budget reform was another crucial element to California’s progress. Second only to term limits, requiring a two-third majority to pass budgets hinders the state. Only two other states require a supermajority, Pérez said, and neither of them then gives the governor a line-item veto. The purpose of the supermajority – consensus – doesn’t happen, he argued, leaving the state gridlocked and requiring the legislature to pass items that have little to do with fiscal policy and “that would never pass muster on policy grounds.” He noted that holding a dollar from family planning, for instance, costs the state nine dollars in federal matching funds. “Why would you want to draw less federal money than more?” he asked. Delays add to the state’s budget woes – to the tune of $25 million a day per day that passes without a budget agreement – and the state’s bond rating declines. Pérez recommended nixing the supermajority, even if a tax increase still requires a two-thirds vote. And even if taxes could be determined by a majority alone, Pérez noted that of the last 14 budgetary challenges, taxes only went up once. “Why wouldn’t I want to have something that helps me improve the situation in those other 13 circumstances?” he asked. In the meantime, without that big change, Pérez noted that he is having budget hearings webcast for more transparency, and careful budgeting of priorities. For instance, he said, while he’s a supporter of education, “I’m not in favor of giving that and throwing more people on skid row.” And as for that great silver-bullet solution to California political reform – the constitutional convention – Pérez dismissed it. “The last constitutional convention did wonderful things like passing change that prohibited Chinese from owning property in the state,” he said. “I don’t think they’d make that same mistake again, but I think it lends itself to getting into the hot button issues instead of structural issues. Read Pérez’s In The Green Room Q&A here.